Today I’m sharing two of my favorite things. Not surprisingly, there are a lot of favorites going on in this bowl, but the main event is a well seasoned skirt steak and fries. I’ve always loved layers of flavors and this bowl has it all, including melted Monterey Jack cheese, sour cream, guacamole, chopped tomatoes, jalapenos, green onion and cilantro with a dusting of queso fresco cheese to top it off. I can vouch for these fries, I’ve been making them for years. They are baked in the oven, yet taste as if they were fried. They are lightly seasoned and stay crisp throughout the pile of layers. Now that it’s officially Spring, I’m looking forward to longer daylight, warmer days and more time to spend outdoors grilling. A good skirt steak is one of my favorites to grill, it tastes so good in dishes like this that can be sliced or cut into bite size pieces. I’ve been seeing a range of new recipes combining steak and potatoes sometimes called Steak Frites or Loaded Steak Fries which inspired this bowl. Remember when rice bowls were all the rage; I can’t wait to see these pop up on menus around town! Joe took me out recently to a new place called Red Door Grill. We were seated in the dining room right in front of a huge glass window looking into the kitchen area where the staff were preparing delectable wood fired dishes. They were grilling burgers, chicken, steak, and fish. Everything looked so tempting with wood smoke rising and open flames shooting through the huge grilling area. I was so conflicted when it came to ordering but in the end I decided on these Rojo Nachos with a green chile cheese sauce, pico de gallo, guacamole, pickled jalapenos, queso fresco and sour cream. You could also add Ancho Pulled Chicken for a couple dollars more. Yes, please!! Our server brought out a massive mound of fresh corn chips topped with all the afore mentioned favorites. I couldn’t decide where to start it was so gorgeous. It appeared that they pooled some of the cheese sauce on the bottom so that the nachos wouldn’t get soggy so quickly. Everything else was evenly piled on with so many complimenting flavors. There was no way to eat it all even with Joe helping me out. A week went by and I was still craving these nachos so I decided it was time to make my own. So what do you think . . . I love big ole burritos stuffed with everything. Sometimes I take the time to make a big batch of them that will last us for several days. And sometimes I wrap them up to freeze for an easy meal later on. I’ve been wanting to try a burrito bowl which is so popular these days. I must admit it is much easier to just layer a bowl with my favorite meat and toppings but I missed the tortilla so I toasted one to have on the side. 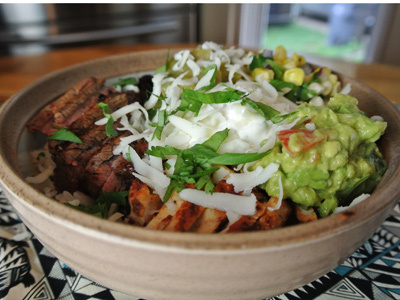 This is literally a bowl of my favorite things starting with grilled steak and chicken that is spicy and flavorful. More goodness comes with a scoop of fresh guacamole, salsa verde, roasted corn salsa, seasoned black beans, sour cream, Oaxaca cheese and cilantro lime rice. Most everything was made from scratch but there are short cuts you can take to make the prep a little easier. There is a visual appeal of a burrito bowl that you don’t get with a traditional burrito that is smashed together once you roll it up. So the question is, do you prefer steak or chicken or both? I’ve been wanting to roast a chicken on the grill for the longest time but was skeptical of the outcome. I had visions of chicken burned to a crisp or maybe a perfectly golden browned outer skin but under cooked on the inside. One of the best things I remember from our days in Albuquerque was going to this little chain called “El Pollo Asado” for the tastiest roasted chicken anywhere. Joe and I used to go after work and order a plate with dark meat (thigh and leg pieces) or white meat (breast and wing pieces) served with tortillas, salsa, guacamole, cheese and sour cream on the side. It was so messy, we picked apart the chicken right at our table. Actually it was so tender it often fell off the bone. 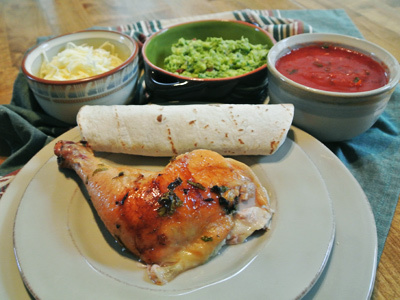 We filled the tortillas with juicy chicken and all the flavorful sides. They had little towelettes at the table to clean up with just like you find at the BBQ joints here in KC. It’s one of those things I’ve often wondered if I could make myself. I wish I would have tried this years ago, the chicken was tender and juicy just like I remembered with the flavors of citrusy orange and lime throughout. I made all the fixings to fill our tortillas and it was so so good. Cooking a whole chicken made for some tasty leftovers. I had enough to add to a pot of green chile and corn chowder as well as a pot of creamy chicken and rice soup. Yummy week!